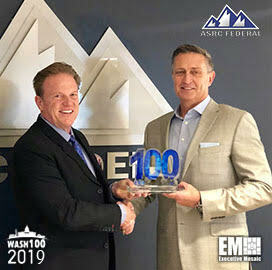 Jim Garrettson, founder and CEO of Executive Mosaic, presented Mark Gray, president and CEO of ASRC Federal, with his fifth Wash100 Award on Wednesday. Executive Mosaic recognizes Gray for driving organic growth and delivering exceptional services to ASRC Federal’s clients. We are honored to present the most coveted award in government contracting to Mark Gray of ASRC Federal. Gray joined ASRC Federal in June 2014 as the president and CEO of the company. In this role, he has driven the corporate strategy, realizing notable organic growth, successfully integrating acquisitions, and expanding ASRC Federal’s capabilities and customer base, while also improving customer service delivery. “It is an honor to be recognized and a reflection of the emphasis and commitment our employees place on delivering exceptional services in support of our customers’ missions,” said Mark Gray. Previously, Gray served as vice president and general manager at URS Corporation from 2008 to May 2014. He was the COO for INDUS Corporation from 2006 to 2008 and a senior vice president at Anteon/GDIT from 1997 to 2006. In 2018, serving as the Chair of the American Heart Association’s Greater Washington Heart Walk, Gray’s efforts helped raise a record $2.458 million for the organization. Gray also serves on the Professional Services Council Board of Directors and other community organizations. He graduated from the University of Notre Dame with a bachelor of science degree in Aerospace Engineering and a MBA from Georgetown University – The McDonough School of Business.